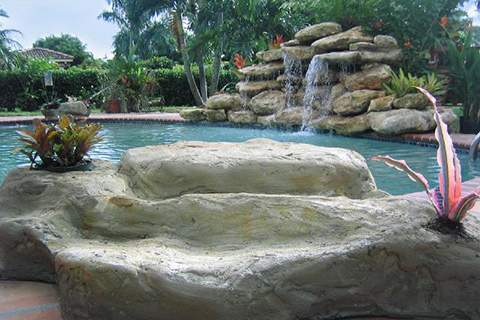 Close your eyes and imagine the sound of water trickling over natural stone on your property. A water feature gives a natural, settled feel to your home or business, and they’re therapeutic and fun. When installed properly, they are low maintenance and offer an escape at your home or business. We can design and install custom waterfalls to fit practically any outdoor space you can imagine. Let Anderson Landscaping design your custom waterfall, and soon you’ll be in your business retreat or backyard paradise. Each Anderson Landscaping waterfall design is made custom to its area and blends in naturally with its environment. The waterfalls we have installed over the years are designed to appear and operate identically to natural bodies of water, as if they’re a result of nature. Our commitment to organic waterfall design truly sets us apart from our competitors. Sitting lazily next to the beautiful pool and sipping away at your favorite beverage is one of the first images that comes to mind when you think about lovely vacations. Swimming pools have become synonymous with relaxation and rejuvenation. Why not take this amazing outdoor experience a notch higher, in your own backyard, with a stunning waterfall that promises to take your breath away? Anderson Landscaping can design and install the custom waterfall of your dreams, contact us today at 305-978-2050 for a free consultation.